If there's something most wood staining contractors want homeowners to understand, it must be the difference between paint and stains. As a professional painting and staining contractor in New Jersey, all too often we hear customers use the word "painting" when actually talking about exterior staining, which leads to confusion in communication. And it's easy to get confused when two products look the same but one is actually a paint, and the other a stain. Or when they look very different but are in fact both stains. But hopefully this guide will tell you everything you need to understand the difference between these products, their benefits and shortcomings, and when to choose which for your project. It's solid stains that often get confused with paints. 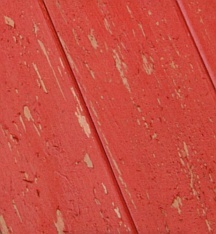 The reason is because solid stains look opaque and cover wood grain just like paints. But unlike paints, which can be applied to virtually any type of surface, solid (a.k.a. 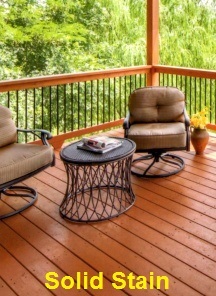 opaque) stains can only be applied to wood or composite decking materials. Another distinction is that solid stains are thinner than paint, so even though they hide wood grain appearance, they still show the texture. The result is a more natural, less plasticky look. Because of their opacity, professional staining contractors recommend solid stains for severely weathered wood or when you want to minimize spotty appearance caused by knots or discoloration. 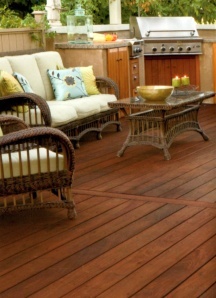 These stains will hide most blemishes, imperfections and signs of aging wood and provide an even, uniform finish color. Opaque stains are less film-forming than paints, but also less penetrating than semi-transparent stains - they are something like a hybrid of the two. For that reason, the surface preparation and application are a bit counter-intuitive. 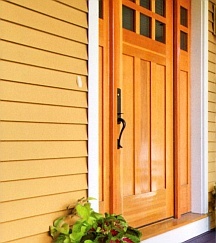 They adhere best to bare wood, but when applied over an existing coating, require a primer (unless self-priming). 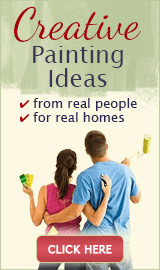 Just like paints but unlike semi-transparent stains, opaque stains can be second coated, if needed for better coverage. Also, while considered more durable than semi-transparent stains, solid stains don't age as gracefully - similarly to paints, they start cracking and flaking off with time. Finally, opaque stains come in limited colors compared to paints, but some are also available with IR reflective technology (which contains pigments that reflect UV rays back into the atmosphere). 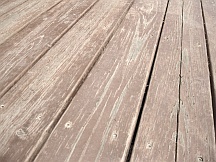 Such IR reflective stains reduce the surface temperature of wood decks so they are cooler under foot compared to typical dark stain colors. Paints (and to a degree, solid stains) work by coating a surface with a protective film, while semi-transparent (a.k.a. penetrating) stains penetrate into the wood. That is why semi-transparent stains are usually lower maintenance than paints and opaque stains - when applied properly, they do not peel or blister, and generally look good even as they are naturally wearing away. Semi-transparent stains look best on woods that are in a good condition - these stains allow the underlying wood grain to show through. They provide a rich, pigmented appearance that accents and enhances the wood's natural beauty and pattern, but will also show any existing wood defects or discoloration. Such stains are ideal for new and unstained woods, but can also be used on previously stained surfaces once the old coatings are worn off or removed. Keep in mind that solid stains and paints are very hard to remove completely, and some residue usually remains inside the pores of the wood, making it difficult for a semi-transparent stain to penetrate and adhere properly. Professional staining contractors usually advise against applying a penetrating stain over such surfaces because the finish may often look blotchy and/or may not dry completely. But old semi-transparent stains can be removed relatively easily with the right chemical stripper, which will open up the pores of the wood so that a fresh coat of penetrating stain can be applied. Because these stains need to penetrate the wood fibers, only 1 coat is usually applied (unless the wood is extremely dry). Any extra layers will just sit on top and flake off or remain tacky. That's why it's important to select the color properly - you cannot build up with this product without causing performance problems. Also remember that it's very easy to darken the wood with the use of semi-transparent stains, but rather difficult to lighten it to any considerable degree. So if you want the final finish color to be much lighter than the color of the wood, the wood must first be lightened with special wood bleaches or brighteners. 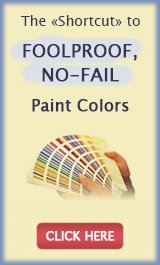 Finally, semi-transparent stains are more finicky than paints and solid stains when it comes to application technique and working conditions. They are best applied with a brush and require at least 48 hours of dry weather both before and after application, but no scorching sun during the process. The best way to check if the wood is ready to accept the stain is to sprinkle some water on the surface - if the droplets sink in, the wood pores are open and dry enough to absorb a penetrating product. Although they look different, opaque and penetrating stains share the same UV protection and mildew resistance properties, with solid stains being slightly more effective due to the higher density of pigment. Regardless of opacity, oil-based products are more water repellent, and they waterproof wood much better than water-based ones. Proper surface preparation is crucial no matter what stain type you use, because just like with painting, the quality of the prep can make or break the end result. 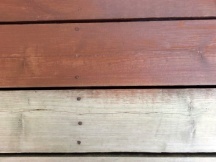 For new exterior wood surfaces, it's best to stain shortly after installation to help prevent wood deterioration, darkening or mildew growth - common results of exposure to the elements. But pressure-treated (green) wood shouldn't be stained until it has had a chance to "leach out" or weather. New pressure-treated lumber requires a 6 week drying period prior to staining. 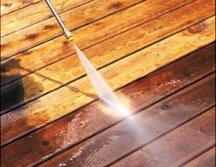 Water-repellent treated lumber needs one year of weathering prior to application. 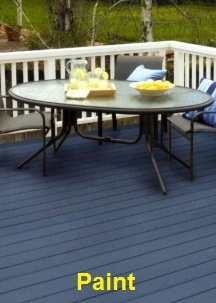 It's also important to know that some products are created specifically for horizontal surfaces like deck floors - they are more durable (against foot traffic, rain, etc.) 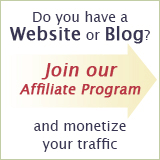 than those specified for vertical use such as siding or fence.